About: News about the Swiss Perl Workshop. We have uploaded videos from this year's workshop to YouTube: Swiss Perl Workshop on YouTube. We are excited to announce The Swiss Perl Workshop 2017. This year the workshop will be held in Villars-sur-Ollon, in the French speaking part of Switzerland. The workshop will be in English. This year, Austrian and Swiss Perl Monger groups join forces to host the Innsbruck on 2nd and 3rd September 2016 (that’s a week after YAPC::Europe). Attendance is free, though we do offer a voluntary business tariff (90€). Thanks a lot for your questions. We hope you find many of them answered in the video, where Will "Coke" Coleda asks Larry Wall your Perl6 questions. Only seven days left (and six to the start of the Perl 6 Hackathon). Now, we need you, even in case your are not attending. The organisers of the Swiss Perl Workshop would like to inform you that they are freeing some hotel rooms by tomorrow, Wednesday 19 August, 18 CET. This post is mostly geared towards Perl 6 newbies who plan to attend the Perl 6 Hackathon at the Swiss Perl Workshop 2015 in Olten, on Thursday, 27 August 2015. We are happy to announce the schedule for the Swiss Perl Workshop 2015. This year's edition of the SPW will be amazing. We are very proud to announce a Perl 6 Hackathon with Larry Wall as part of the Swiss Perl Workshop 2015 by end of August. Larry already confirmed to come and it is a great honor for us to host him. 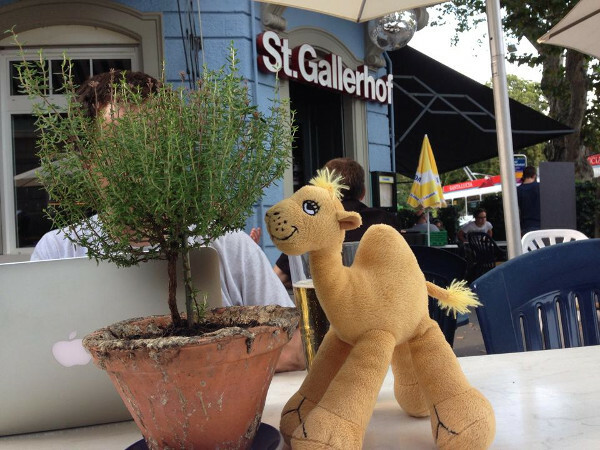 The camel was at a Meetup, again, together with some Perl mongers. In a bit less than two months the second Swiss Perl Workshop takes place. Lots of cool things are going to happen! Register soon to secure one of the limited tickets. For this year's Swiss Perl Workshop we rented a house that is perfect for all sorts of workshop-like activities.